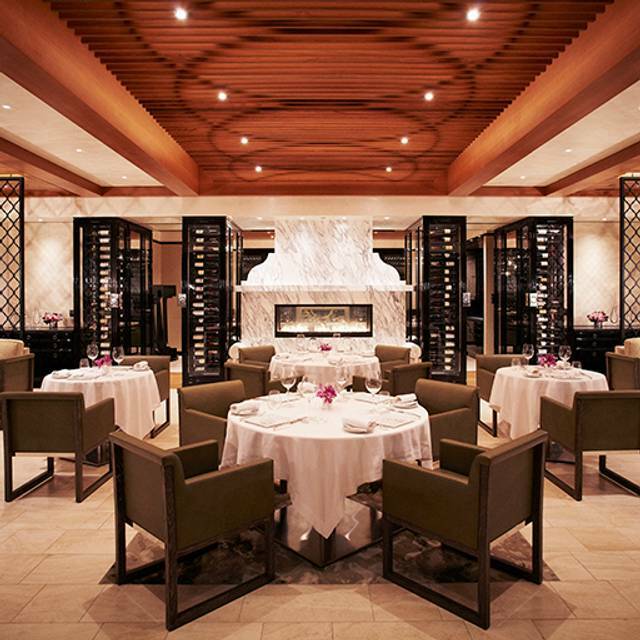 You must make reservations at least 5 minutes in advance of the time at Wolfgang Puck at Hotel Bel-Air. Stop in the Bar & Lounge before or after dinner to enjoy live classical and jazz piano entertainment nightly. 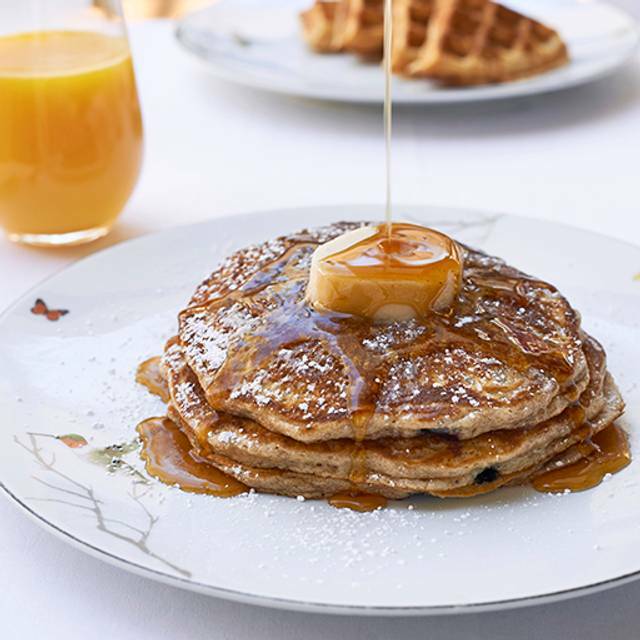 Wolfgang Puck at Hotel Bel-Air is pleased to host the popular visiting Chef Series throughout the year and regular BBQ events during the summer, follow us on social media or view the website for special event dates and menus. 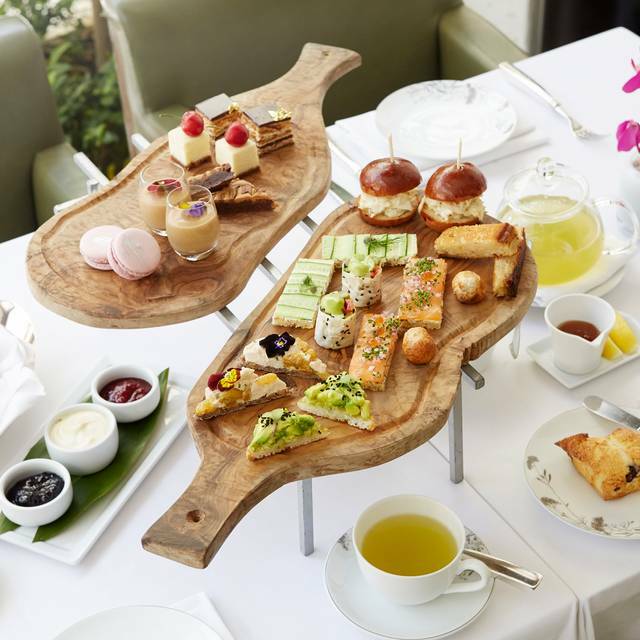 With over 10,000 sq ft of elegant indoor and glorious outdoor function space, Hotel Bel-Air is a tranquil respite from the hustle and bustle of the city located just outside the gates of Bel-Air. 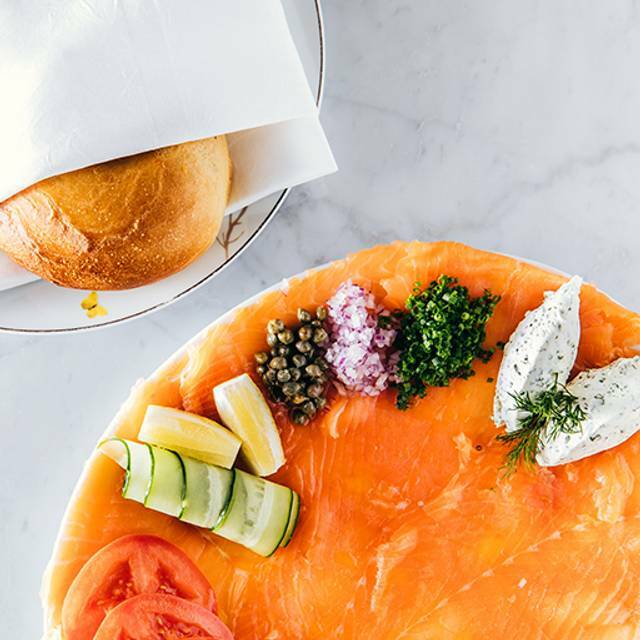 Paired with the legendary cuisine of Master Chef Wolfgang Puck, experience a new level of innovation and inspiration to your next event. The private dining room has a gorgeous glass wine cellar displaying 2400 bottles of wine. 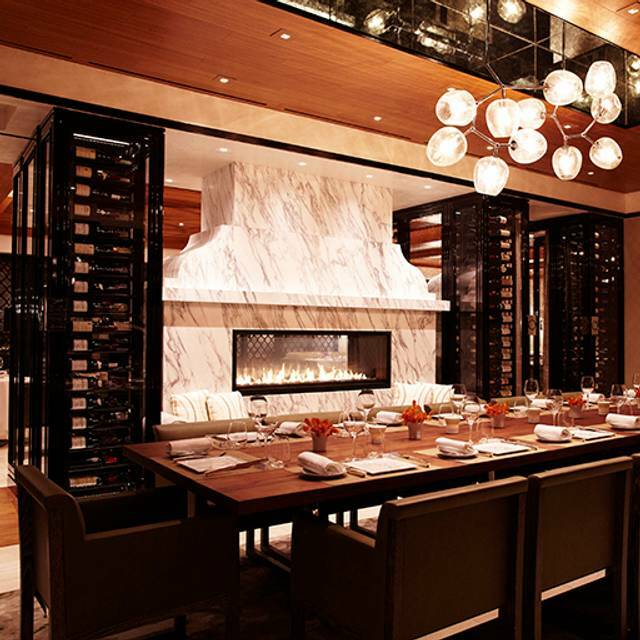 The space features a marble fireplace and can accommodate up to 14 guests with enough space to mingle before dinner. The Chef will cater to our guests with special treats and the famous Chef choice tasting menu will always be an option. 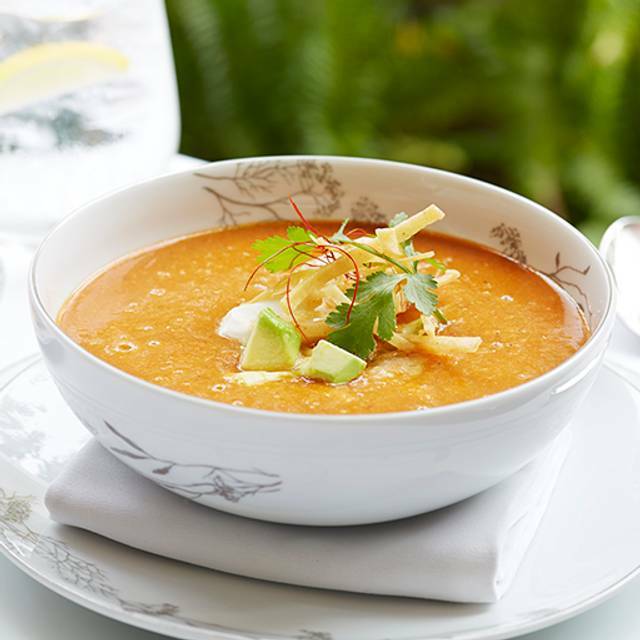 Wolfgang Puck at Hotel Bel-Air features modern California cuisine with European and Mediterranean influences in a spectacular garden setting. Our chefs visit the farmer’s market every week and select the freshest, most seasonal items to utilize in our menus. 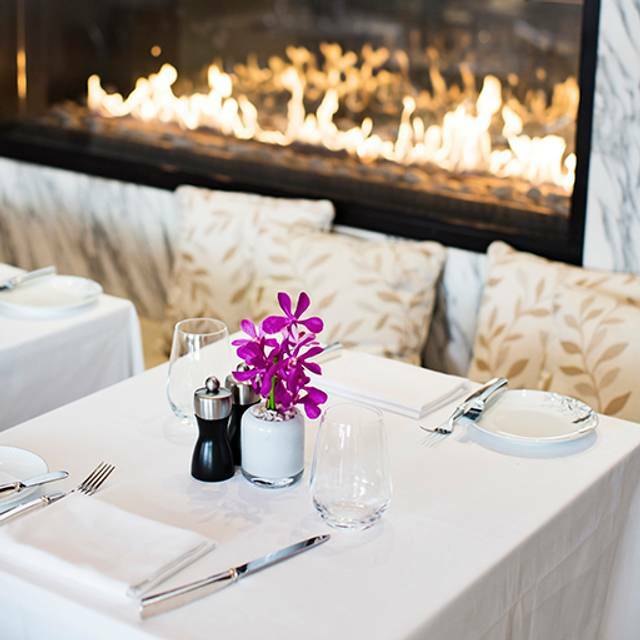 Dine in the elegant dining room, on the alfresco terrace, or in the bar and lounge. The restaurant is also a certified Green Business by The California Green Business Network (CAGBN). You would expect is top notch. The food was amazing we split the porterhouse and the dessert selection was good. I’d definitely come back and would highly recommend. It’s not cheap but well worth it for a special occasion! Mark our server was fabulous! Enjoyed the service/dinner/ambiance very much and look forward to going back soon. Great! Loved it! My gf and I had a wonderful time. Excellent food, excellent service. 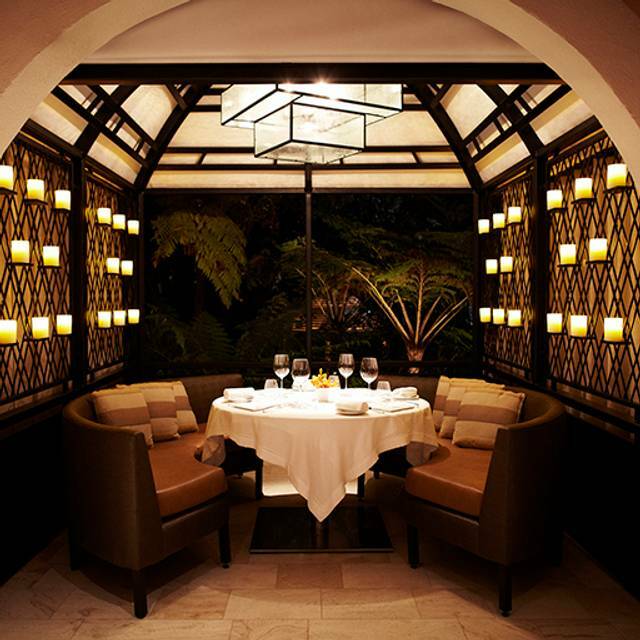 As always, this restaurant tucked in the Hotel Bel-Air did not disappoint. From the moments upon entering, to the final good-bye's, the service is the highest quality in Los Angeles. We requested a private table in our reservation for a business lunch meeting and was given exactly as requested. The server and assistants were always prompt and attentive. We had lunch items of Salmon, Sandwich and Salad, respectively, along with some of the best ice-tea and coffee. We were not rushed and every item was fresh, without a detail unnoticed. Requested a few changes to the chopped salad and it arrived exactly as ordered. The pricing is perfectly matched for the caliber of food, service and privacy you receive and expect at the hotel. Peaceful ,pretty place with good food and refined service. Fantastic meal. Always impeccable service and delicious, creative, and fresh dishes. Lovely setting. Comfortable tables. Wonderful evening. A perfect brunch location for a special occasion! Superb surroundings and lovely atmosphere make you forget that you are in hectic Los Angeles for a few hours. So so. Dining room really needs an upgrade. Half of us liked our food and half of us did not, but no one ever asked. Definitely not a good value, but you don’t expect that here anyway. Other members loved everything they ate, I enjoyed my sandwich and fries (fries were amazing) but my salad was not that good. Although my cousin got the pea soup (wish I had) and says it was amazing!! Wedding anniversary celebration for brunch. The setting could not be lovelier for a special dinner or lunch. The food was tasty. We did wait quite a while for bread, which we were told was still baking. Indeed it was delicious and hot out of the oven. I tried a tequila based drink called "Broken Promises," which was delicate and delicious. It is worth noting that there is a bar menu to order off of as well. The tortilla soup and shrimp cocktail were both excellent. All in all it was a nice evening. Food was delicious, restaurant was quiet and casually elegant. Attention to and knowledge of gluten allergy was impressive. Highly recommend and look forward to going again. It was our first time there and certainly a few lines hit the A+, such the service and the wine list. Knowing the Pekin duck from Spago, we were disappointed by it that evening. The rest was great. It was perfect — table, food and server! Consistently good food and service every time I’m here. This is always my favorite place to escape for lovely meal in a beautifully serene environment that never feels like I am just around the corner from home. The new furniture is lovely and just have the restaurant a mini-lift to an already beautiful place. As usual the food was delicious, the best avocado toast and my oat latte was the perfect start to my day. FIRST OFF, VALET PARKING @ $20, WHEN VALIDATED $15. FOOD PORTIONS SMALL. FOOD SERVED MILD WARM. Dull menu. Overpriced. Trapped into a 3 course prix fixe. The service started out great but as the restaurant got busier the service declined. It is VERY expensive so the service really needs to be commensurate to the food prices. Overall a lovely night but could have been perfect. Bad experience, no comment! Food disappointing. The Lounge is a fantastic place to enjoy fine dining and entertainment simultaneously. The food, service & quartet were top notch - great night! I really enjoyed dining at this hotel’s restaurant! Great all around! Thank you! Fantastic and memorable dining experience - wonderful hospitality all around. The lunch was horrible as there are few options for vegetarians or vegans. The pasta was stale. The grilled tofu salad was very bland. The only great thing was their fresh juices. For what they charge, the food should be top quality and it was not by any stretch of the means. Nothing was prepared properly and after pushing the 18 year old balsamic with the burrata salad, they brought out soy sauce. Also, first time I've ever seen chicken for $65 and 70% wasn't eaten and the lamb chops were 80% fat. Oh, and the dessert was served cold when it was supposed to be a hot dessert and when asked, the server said it is meant to be served cold. Ah, no. Very disappointed. Remarkably poor service and quality control for the Hotel Bel Air. The french fries came cold, the pasta had to be sent back twice (the ignored an allergy the first time and left out the main ingredient the second time) and we had to repeatedly ask for service and about the status of our food (which took way too long). I am so sick. Can’t explain how terrible I feel right now. After 40 years of avoiding certain food for religious beliefs and everything I standby you seem to have ruined living and dining out for me forever. You have officially ruined all I have lived for and my beliefs. My servers, assist manager and all other help whom was responsible for experience should all be fired. Sorry to say. I have never ever said something like this but my experience is absolutely unexceptable. And, to mention how the situation was handled. Needless to say I am so sad and feel like no one really truly cared. Consistently excellent service and food. I have never had a poor experience here. Highly recommend the salmon and bolognese. Best Dinner during DineLA week, January 2019. 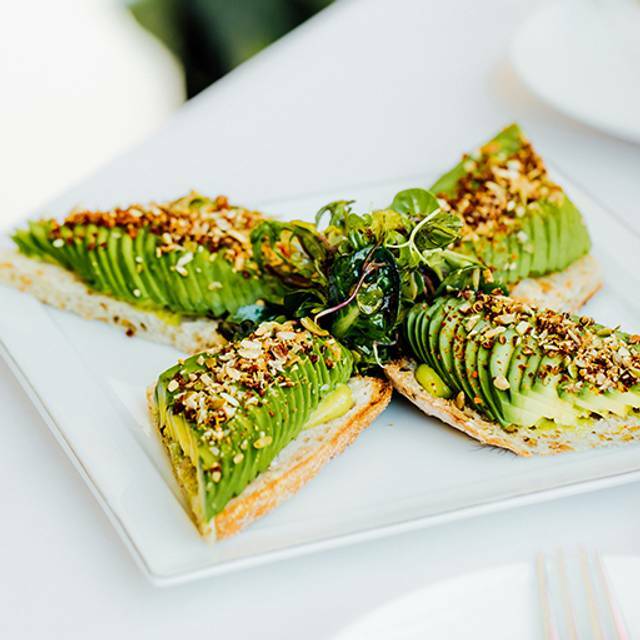 My friends and I made it a point to try 5 or 6 top restaurants that we might not otherwise get to, and hands down, Wolfgang Puck at the Hotel Bel-Air was tops. Most of the other restaurants had at least 1 (out of 3) courses that was a miss. Wolfgang Puck served--I lost count--maybe 8 or 9 courses--and everyone was exquisite. This is not a place you go to once a week--it's very expensive and the food is loaded with simple carbs and animal fat. But for a splurge, you simply cannot beat it. I'll be back . . . in a year or so. First class in all departments. Food: Great. Service: Outstanding. What more can one ask?